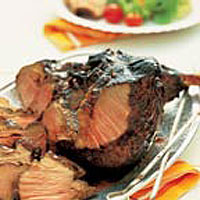 The combination of lamb infused with garlic and anchovies makes an unusual dish for the barbecue. It is easy to prepare, with little to do at the last minute, making it ideal when entertaining. Part-cook the lamb in the oven, then finish on the barbecue to develop the flavour. Remove the string from the lamb and open out the boned end. Place in a large, shallow, non-metallic, ovenproof dish. Tip the anchovies and their oil into a small bowl. Lift out the fillets, finely chop, then return to the bowl with the olive oil, garlic, vinegar, pepper and orange rind. Chop most of the oregano and add to the marinade, reserving a little to garnish. Using a spoon, spread the mixture over the lamb, turning it so it is completely coated. Cover loosely with foil and chill for at least 4 hours, or overnight. Preheat the oven to 180°C, gas mark 4. Keeping the lamb covered with foil and in the marinade, roast it in the oven for 1 hour. While the meat is cooking, light the barbecue. Remove the foil, then transfer the meat to a barbecue rack, reserving the juices. Barbecue the lamb for about 30 minutes, turning it frequently, until evenly coloured - it will look charred on the outside. Strain the marinade juices into a small pan. Add the orange juice and honey, bring to the boil and let it bubble for about 3 minutes, until thickened. Place the lamb on a serving platter, pour the glaze over and garnish with the reserved oregano. You can cook the lamb completely in the oven. Roast it, uncovered, for 15-20 minutes per 500g, depending on how pink you like it. Make the glaze as above. To make the meat easier to turn on the barbecue, thread it with 2 long, sturdy metal skewers. For more information about barbecuing, look out for our outdoor eating and food safety leaflet.